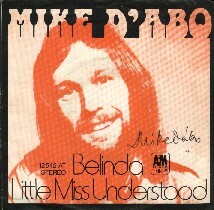 After leaving Manfred Mann, Mike d'Abo had been offered a contract with Immediate Records for which he made one single and one album, both entitled "Gulliver's Travels". Then he switched to MCA Records and his first album was issued in mid 1970, simply titled "d'Abo". His next project found himself scoring for the Peter Sellers/Goldie Hawn movie "There's A Girl In My Soup", and from this came the single "Miss Me In The Morning/Annabella Cinderella" in December 1970. 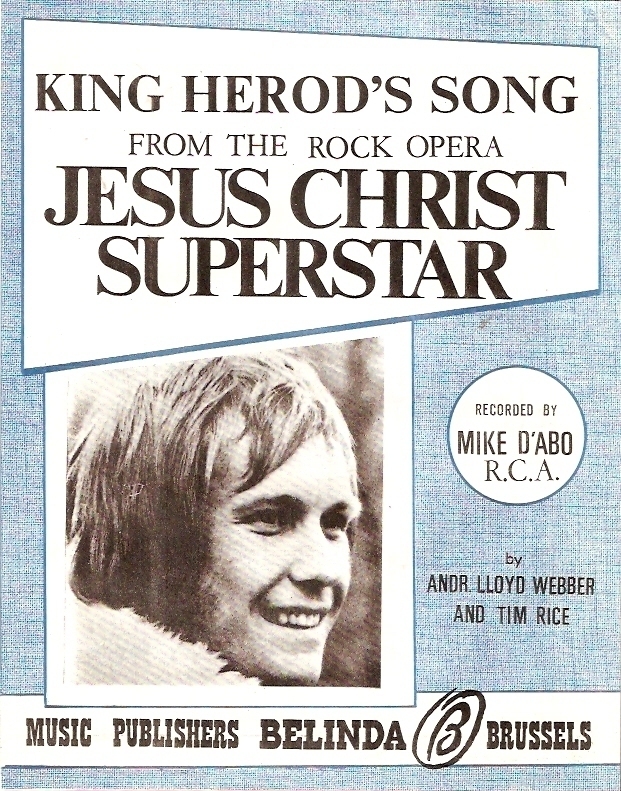 1971 saw the release of the "Jesus Christ Superstar" album on MCA, on which Mike d'Abo sang the part of Herod. In June 1971 he signed with Chrysalis Records, though nothing of his recorded work for this company was released. Anyway, by the end of the year he changed companies once again, this time to the American A & M Records. The best period of his solo career was just about to begin. His debut album was "Down At Rachel's Place" followed by the single "Belinda/Little Miss Understood". Nothing more was heard from Mike for more than a year, then he re-appeared as composer of five songs on the debut album of John Christie "Relax". Halfway through 1974, another single emerged: "Fuel To Burn/Hold On Sweet Darling" which served as an introduction to his solo album "Broken Rainbows". It received very favourable reviews, though like his earlier solo outings, it was not successful on the charts. Then we had to wait for more than ten years before Mike d'Abo released his last solo album "Tomorrow's Troubador" on the President label. This album has some Manfred Mann covers and some new material as well, and as artists are mentioned: Mike d'Abo & His Mighty Quintet. At this moment Mike is working as a DJ for Gloucester Radio, and he also does some Manfred Mann revivals shows every now and then. I also have a demo record of "Miss Me In The Morning/Arabella, Cinderella" which has "Arabella, Cinderella" on both labels, but still the a-side plays "Miss Me In The Morning". From the above five acetates I have two of them: "Handbags And Gladrags" which is the same version as on Mike's solo album "d'Abo" and "Get Out Of His Life Girl", which is a song which was never released by Mike, so you probably can imagine that this is one of the best items in my Mike d'Abo record collection. It's also nice to mention that Mike's name was misspelled on the "Handbags And Gladrags" acetate: D'ARBO. The other acetates have in total four songs, and Mike didn't put any of them on his records. Only "In The Beginning" was recorded by the Dutch/German group The Boots. Mike also had sheet music from this song, which he let me photocopy. Mike also had an acetate album, but that was the same as the "normal" release "Down At Rachel's Place". This really is one of the most strangest albums ever made. The album opens with a few lines from "Do You Believe In Magic" by The Lovin' Spoonful and then passes into "Silent Night". There is a lot of noise but little music. In fact the only "normal" song on the album is "Afterglow", which was a smash hit by The Small Faces. Instant is a sub-label of Immediate. Another strange point about this album is, that no musicians, no songwriters, no producer nor anybody else is mentioned on the cover or on the label. You can hear that Mike d'Abo is singing every now and then, however his name is not even printed. Mike was playing a role in the theatre production of "Gulliver's Travels", and it was there that he got the idea of making the record. The album is very hard to obtain and is a real collectors item. There probably were not many copies made of this very strange album. Also the spelling of the album title is a bit strange. On the front cover is printed "Gullivers Travels", on the back cover and label is printed "Gulliver's Travels", while the individual songs on side a and b are called "Gulliver Travels". The last strange thing I want to mention about this album, is that it was released before Mike parted from the Manfred Mann group. The "Gulliver's Travel" album was issued on the Immediate subsidiary label Instant in 1969. It has always been a strange album, which often was put on the Mike d'Abo discography, because the Mike d'Abo songs "Gulliver Travels" and "See The Little People" were included and because Mike played the main role in the "Gulliver's Travels" musical in the Mermaid Theatre. It's a very hard to find album, so it was a great idea to release it on CD and the inclusion of the mono versions of "Gulliver's Travels" and "See The Little People" make this CD even more interesting, but the most interesting item of the CD is the inclusion of the never released Mike d'Abo song "In The Beginning". I knew this song, because it was released by the Dutch/German band The Boots, which even made it a small hit in Holland. All songs are written by Mike d'Abo, except for "Woman In My Life", which was written by Tony Macaulay/d'Abo. This album has 12 tracks, and I’ve found 6 songs that are recorded by other artists, which is quite unique. The information about these tracks you will read further on in this book. Mike d'Abo played the part of King Herod in "Jesus Christ Superstar", so he only sings "King Herod's Song" on side three of the double album. I was much surprised to find the Russian 2LP set in a second-hand record store in Linköping/Sweden. In Russia the album was officially released in 1991. All songs are written by Mike d'Abo. The album is produced by Chris Demetriou. In 1998 I discovered that this album was made of red vinyl. You don't see that when you take the album out of the sleeve, but when you hold the album to a light backgroup and you will see that the album is indeed made of red vinyl. It's always interesting to look at the musicians of an album. We will find Mo Foster back in the Smith & d'Abo band. Grant Serpell plays drums in Sailor, who took Smith & d'Abo on tour through Europe. Mike Moran can be found as the main musician on Dave Clark's soundtrack album "Time". All Songs on this album are written by Mike d'Abo. "Handbags And Gladrags" on this album is not exactly the same song as on the "d'Abo" album on Uni UNLS 114. However, even though Mike d'Abo didn't have any chart success, he could persuade many well known musicians to play on his albums. Artists like Albert Lee, Chris Spedding, Mo Foster, John Kongos, Graham Nash, Mike Bloomfield, and The Jordanaires are well known to all of us. Backing vocals: Lynn Sheppard, Dik Cadbury, Mike d'Abo, Regine Candler. The album is produced by Mike d'Abo & Eddie Hardin. We know Eddie from The Spencer Davis Group and Hardin & York and countless contributions to albums from all kind of artists. It's also nice to see that Mike wrote the song "Ships" together with his Manfred Mann mate Tom McGuinness. This is a bit funny, because there were no Mike d'Abo/Tom McGuinness songs released when they played together in the Manfred Mann group. 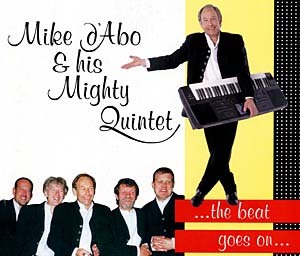 This album was released as Mike d'Abo & His Mighty Quintet. The album "Gulliver's Travels" is a rare and hard to find Mike d'Abo album, but this one is even more hard to find. I discovered this album in 1991, but didn't find a copy until Mike d'Abo himself told me to go to the office of the record company President Records in London. There I met the managing director David Kassner, who gave me a copy of the album. Later he also took care that I got the three singles that Mike released on the President label. The album title is "Tomorrow's Troubador", which causes confusion, even at the office of President, because on the single "Tomorrow's Troubador" they spell the LP title right, but on the second single from the album they spell the album title as "Tomorrow's Troubadour". Can anybody tell me what is right and what is wrong ? At least I can tell you that Mike is singing "Troubador". Side one has all new songs, while the first five songs of side two are songs that made Mike d'Abo famous as a writer and/or singer of Manfred Mann. The song "Tomorrow's Troubador" is really a fantastic song and is one of the most played songs in my house since I got the album from David Kassner. The album was produced by Mike d'Abo and Dik Cadbury and engineered by Mick Dolan. The songs were recorded at the Millstream Sudios, Cheltenham, a place in the neighbourhood of where Mike lives today. This is the only vinyl compilation album I've found so far with a track by Mike d'Abo. A & M Records choose one of the best Mike d'Abo songs for this "Family Portrait" album, which has a string of great names. It's nice to see Mike d'Abo among such names. When playing the Mike d'Abo track for the first time, I immediately heard that it wasn't exactly the same track as Mike released it on his album "Down At Rachel's Place". I bought the above 3 CD-set during a visit to London in October 1992. Since the early sixties Rod Stewart had switched from various R 'n' B bands and in between attempted a solo career, his first single for Decca "Good Morning Little Schoolgirl" was followed by a stint with the Hoochie Coochie Men and Long John Baldry who he again joined in Steampacket. Next he recorded a version of Sam Cooke's "Shake" for EMI before a brief involvement with the Shotgun Express - whose line-up included Peter Green and Mick Fleetwood, in 1967 he signed with Immediate. 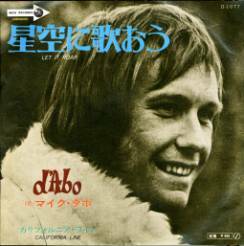 Mike d'Abo had recently joined the company and written a song "Little Miss Understood" for Chris Farlowe, but it was agreed it would be better suited to Stewart, so one of the label's finest singles was recorded, released and ignored - 263 copies were sold. Various other projects fell through - but he did get to meet The Faces. In 1967 as manager, Andrew Loog Oldham's relationship with The Rolling Stones drifted apart, plans for Rod Stewart and P.P. Arnold to record an album with Jagger producing also fell apart, a few tracks were cut and this is one. Mike d'Abo was then set to take over the production duties but Immediate released Stewart from his recording contract to allow him to join the Jeff Beck Group. Another change of writer and producer for Farlowe, and probably his finest vocal performance on this plaintive Mike d'Abo penned and produced song. It should have charted higher than no. 33 and had Farlowe been Rod Stewart, who later recorded the song, it would have. As Andrew Oldham would say "It's all down to image". D'Abo came to Immediate to write and produce after the break up of the Manfred Mann group where he had replaced Paul Jones as vocalist. At the time Andrew Oldham and Sean Kenny were producing a musical based on Jonathan Swift's "Gulliver's Travels" to play for a short season at London's Mermaid Theatre at the request of Sir Bernard Miles. They asked d'Abo to write some additional music and eventually invited him, to play the lead role. He did. A soundtrack album was released, possibly the strangest soundtrack ever, with "See The Little People" as a single. Both were withdrawn a week later when d'Abo's previous record company insisted that he was still under exclusive contract to them (such minor details seemed frequently to harass Immediate! ), but the single appears here as a part of the story. There is no story about this track in the souvenir booklet, but because Mike d'Abo was involved as writer and producer of this song I wanted to mention this song. On 28th January 1967, the Small Faces received an award from Jackie Trent for winning Radio Luxemburg's "Battle of the Giants" competition, having beaten Manfred Mann in the final. Later that evening, the lads dropped in on the Rolling Stones, who were recording a session in a nearby studio. Kenny says: "We were doing a lot of session work at the time. Steve and Ronnie were getting into producing and writing for other people because Andrew was encouraging them and taking a lot of notice of us, as he saw that we weren't just a pop band. I was doing some sessions for Immediate with Mike d'Abo, and one of the tracks that came out of that was "First Cut Is The Deepest" by P.P. Arnold. We finished the track, and then did a couple more, just me and Mike on piano. Rod Stewart came in a week later, and sang on another track which turned out to be "Little Miss Understood" - that was what I was like, we were all in and out of each other's studio, having a play on this or that, or someone would come in and play on our stuff". This first new material by Mike d'Abo for many years. A duet by the two lead singers of Manfred Mann is something unique of course. As the Manfreds they toured a lot and gave many shows, but now you can hear them on CD. On the first Wizard's Convention Mike d'Abo sang a duet with Mike Smith, so for full information see the part in this book that describes that musical period of Mike d'Abo. On this CD many well known artists like Chris Farlowe; Tony Ashton (from Ashton Gardener & Dyke); John Entwhistle (the Who); Denny Laine (Moody Blues and Wings); Eddie Hardin (Spencer Davis Group); Phil Manzanera (Roxy Music); Zak Starkey (son of Ringo Starr; he also played on the Mike d'Abo album "Indestructible") and Chris Thompson (Manfred Mann's Earth Band). "Here I Go Again" is written by Eddie Hardin and Ray Fenwick. Eddie Hardin plays keyboards; Mo Foster (who was also in the Smith & d'Abo band) plays bass guitar and Ray Fenwick plays guitars. It's a ballad with lots of harmonica play by Paul Jones, a thing that he can like no one else can. February 1997 saw the very first release from Angel Air Records, a specialists independent record label created to bring to the market, rock and pop music from artists from the 70's, 80's and 90's on CD only. This CD has tracks from the 15 first released CD's from Angel Air. From the CD "Wizards Convention 2" (which was the 9th CD from Angel Air) you will find as 9th track on this CD the song that was sung by Mike d'Abo and Paul Jones called "Here I Go Again" which is a very good choice by Angel Air. The costs of this CD are only £ 4,99 and can only be ordered from the records company itself (as far as I know). I got to know about this 3CD-set when I visited Mike d'Abo at his house in October 1997. There he showed me this Reader's Digest CD and played to me one song: "Now That I Need You", which is a song from the musical "Red, Hot, and Blue". The song is sung by Mike d'Abo and has Paul Jones on harmonica again like on the "Wizard's Convention 2" CD. Also this song is a ballad and Mike told me, that he really liked this song and sang along when playing it. After I got home in Holland, I tried to buy this 3CD-set from Reader's Digest itself, but that was not that easy. Due through copyright laws it wasn't possible to send the CD to a country outside England. But they were willing to send the CD to a "care-of-address" within the United Kingdom, and because I have a lot of friends in the UK, I asked Alan Clayson to help me and of course he did. So after all I did get the CD, which has 43 songs in total sung and played by well known musicians. All songs are from musicals and I take this CD among my rarest Mike d'Abo items. of The Marmalade) and Reg Presley (The Troggs) sing hits from the nineties. I've put the original artists between ( ) after the artists who are singing on this CD. Instant was the short-lived sub label of Immediate. Instant took care of some very rare releases of which was the soundtrack album of "Gullivers Travels", which is often seen as an album by Mike d'Abo, one of the rarest releases. Besides the two Mike d'Abo songs, Mike is also present on this CD as producer of three songs by Twinkle: "Micky" (the normal 2,27 version), "Darby & Joan" and "Micky" (the 3,34 previously unissued long version). This last song makes this CD special for us Mike d'Abo record collectors. Mike can also be heard as pianist on "Micky". The booklet that accompanied the CD release show the album cover of "Gullivers Travels" and the front of the "In The Beginning" sheet music, which is a rare item, because the song was in fact not released in the 60's. On the face of it, Andrew Loog Oldham reverted to more familiar territory in February 1969 with the release of the album "Gulliver's Travels" (Instant INLP 003), which appeared to be the soundtrack of the play of the same name that, with Manfred Mann's Michael d'Abo as the star, was packing them in at the Mermaid Theatre in London. However, as was par for the course in the often surreal late 60's world of Oldham, all was not as it seemed. Far from being a literal soundtrack to the stage show, the Instant album was a bizarre aural montage that, aside from occasional moments of near-lucidity, included various snippets of songs both from and outside the Immediate vaults. The full story of the album, together with d'Abo's bemused comments ("I took it home and listened to it and thought – My God, what is this cacophony?! "), can be found on the recent CD reissue (Sanctuary CMRCD 063). However, for your delectation and delight, we've selected a couple of tracks from the project. "In The Beginning" was recorded by Michael d'Abo with the assistance of the Mike Sammes Singers and the Small Faces duo of Ronnie Lane and Kenny Jones, though it should be noted that, inexplicably, Oldham left the track off the album, and the song didn't gain an airing until the last twelve months or so, when it was included as a bonus cut on the aforementioned CD repackage! This CD was released as The Manfreds. It took quite a while before this CD could be released. Mike told me already about it at our first meeting in 1993 that he was working on it. It seems that Manfred Mann isn't very happy with this project. I saw the Manfreds in concert for the first time in 1996 in Ipswich and I can assure you that the crowd went crazy. The whole evening everybody was singing along with all the songs. Not all of the songs are recorded that well in my opinion, but that probably become because I know the originals so well. Only when the song is arranged in a different way than the original, they come out much better. Therefore I like the following three songs the most: "Oh No Not My Baby", "You Gave Me Somebody To Love" and "Handbags & Gladrags" (three ballads, by the way). However the Manfreds play many solo hits during the concerts, only one of them was included on this CD: "Handbags And Gladrags", and when you've been at one of their concerts you know why. This song got so much applause !!! "Handbags & Gladrags" on this CD is a sort of unplugged version, with Mike behind the piano, Benny Gallagher on bass, a little keyboards and some tambourine and is far out the best version of this song I've heard so far, and I've heard quite some versions. When I was at Mike's house on October 31, 1997, Mike taped a similar version for me on cassette. On the CD they only added some keyboards and tambourine. The Manfreds have been touring the Far East and Australia a number of times, so it's not a big surprise, that the CD was released in Australia too in the same form as the UK version, only a couple of lines on the booklet have been changed. 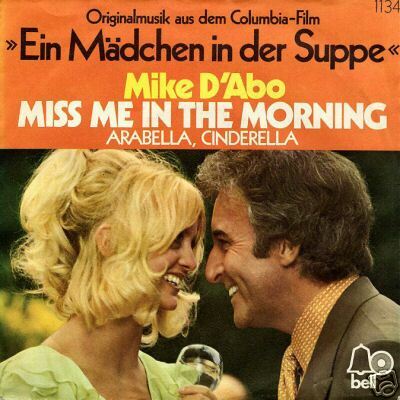 In January 1999 I found out about the USA single "Miss Me In The Morning/Arabella Cinderella" on the Bell label. My copy is a "promotional copy - not for sale" and is the only one I've ever seen or heard of, so there might not be an official release of this single. Is there anybody who can give me more information on this item? See the U.K. discography for more details. It seems that this single is only released in France. In the U.K. and U.S.A. these tracks are only available as LP-tracks. This single was released with a picture sleeve in Denmark and is so far the only release I found from this country. It took quite some time to get this CD in the shops, because it has a song by Gary Glitter, who has been arrested in 1999 and the record company thought that it was not a good idea to release this CD at that time. Probably that problem has been solved, but I doubt if the CD really reached the shops. I think it was only available through the internet. The CD has a lot of sixties artists singing Christmas songs and it is really great to see Mike d'Abo with the song "Old Time Kinda Christmas", because there are many CD's released by Mike the last couple of years, but not too many have new songs by Mike. Also nice to see two songs by Dik Cadbury, who used to be in Mike d'Abo's Mighty Quintet. Another rare Christmas collection from Germany, with many well known artists (The Temptations/Stevie Wonder/Mike Oldfield) and some totally unknown (at least to me). Again "Old Time Kinda Christmas" by Mike d'Abo has been included, and because the CD has been released by Polydor Records, it is something special. 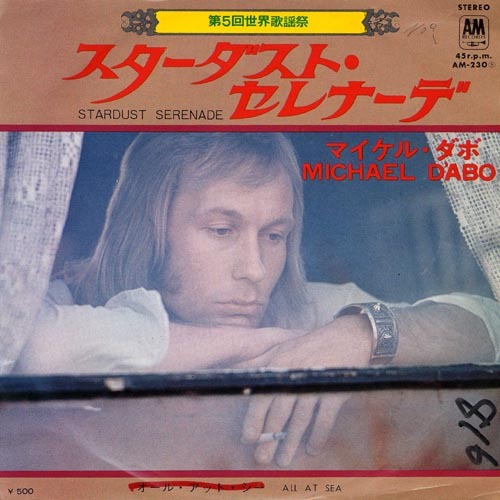 In 1974 Mike d'Abo took part in a Japanese song contest, in which he sang "Stardust Serenade", which is only released in Japan on a single and on a compilation album, featuring all artists from that song contest. During my March 2004 visit to the house of Mike and Lisa d’Abo, Mike gave me this single and you can imagine, that this is one of the very best items that I have in my large Mike d’Abo record collection. The picture cover of the single is at the top of this part of the Mike d’Abo website. Until I saw it advertised on the internet, I didn’t even know this album existed. The album only cost me US$ 9,99 plus postage !!! The inlay with the song lyrics in English and Japanese, plus the obi is included, so another fine item in my Mike d’Abo record collection. Also this album I discovered on eBay in November 2007 for the first time. When I started the Mike d’Abo website, I thought that there was only one Mike d’Abo record released in Japan, the single “Stardust Serenade/All At Sea”, but meanwhile I have two 70’s albums from Japan in my collection plus one more single. Is there more to come ? I found this single at a record convention in Holland in 1997 and it's one of the best Mike d'Abo items in my collection, because it has a beautiful drawn cover in which you easily recognise Peter Sellers and Goldie Hawn. Both songs are from the film "There's A Girl In My Soup" or as is printed in Swedish on the single cover "En Flicka Pa Gaffeln" (see the picture cover at the top of the Mike d'Abo solo records). All songs which I don't know the composer of are from the album "Gulliver's Travels".